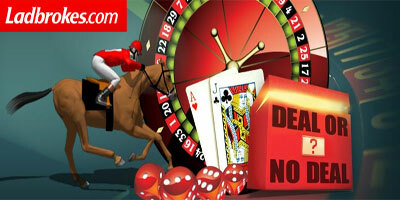 New to Ladbrokes Games? You can claim £5 free on their Game of the Week! This week it's Deal or No Deal Jackpot! Open a new account righ now, Ladbrokes will give you a £5 new player bonus (no deposit required). Register by clicking the button on the page complete the claim form below and your £5 bonus will be available in your account within 48 hours! This offer is only available to customers who have not played at Ladbrokes Games before. One free games bet per customer, per household, per shared computer and shared IP address. Customers with multiple accounts will only be able to receive the offer once. Offer expires 30th September 2011 (23:59 BST). No claims can be made after this date. This offer may be claimed in conjunction with the new customer welcome bonus for Games (100% match up to £100). This £5 free (no deposit required) promotion can only be claimed via a claim form above. Offer available to over 18s only. Offer available to UK customers only. Your free £5 may only be used to play Game of the Week only at Ladbrokes Games. Your free £5 will be available for 7 days from date of crediting and removed from your account if not used within this time period. The Promoter reserves the right to refuse any promotional offer to any player for any reason, or to withdraw an offer at any time. No correspondence will be entered into. The Promoter reserves the right to suspend, cancel or modify this promotion at any time (and for any reason) without notice. Ladbrokes Games reserves the right to limit the eligibility of a customer to participate in a promotion or exclude players from a promotion if there is reason to believe any player is abusing a promotion. Customers found to be abusing the spirit of any Ladbrokes promotion may have their accounts suspended. Promoter: Ladbrokes International Limited a company registered in Gibraltar with Company Number 46808 and whose Registered Office is Ladbrokes International Limited, 57-63 Line Wall Road, Gibraltar. "Ladbrokes Games: £5 Free - No Deposit Required"